This blog started way back when I barely knew what a blog was. It was created as a way for all of us who worked in my former retail shop to keep in touch with our friends and customers, both near and far. Over time, the other writers dropped off, and it became mine alone. I no longer see it as a marketing tool for my business, but rather a way to keep in touch with friends and afford me a place to capture some of those things that I seem to write constantly in my head. As it has become more personal than business, I've still kept my family postings few...because I have a level of privacy I like to keep. Having said that, today I'm doing a "Proud Mama" posting about my son and his wife, who together run a sport fishing business in San Diego while raising a lively 4 year old son. 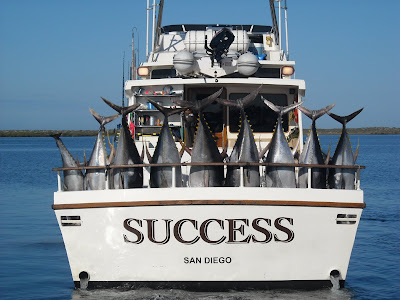 If you or anyone you know is interested in fishing, please visit their website at SuccessSportfishing.com. I'll stop the marketing here and share with you my excitement: two weeks ago, while running a charter in Magdalena Bay in Baja California, they had one of those days that fishermen dream of. The waters were teeming with fish, and everyone on board had a record day. One of the customers caught a 362 lb. (if I recall correctly) yellow fin tuna, a record for the boat. 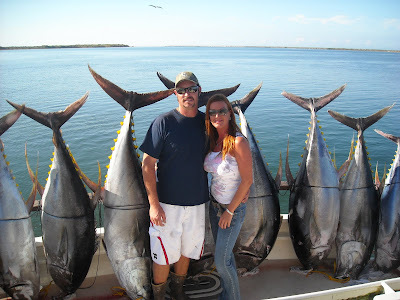 Erika, my daughter in law, caught a 276 lb. yellow fin, after reeling it in for almost two hours all by herself. Here's where the proud mom stuff comes in. When they returned to the village of Lopez Mateo (a village so small that it has no hotels, motels, or restaurants, to my understanding) my son gave all the fish that wasn't going home with clients to the entire village. Those who couldn't get to the dock had a home delivery by one of his crew. This is the man I admire so much...who chose a hard life and lives his dreams, sharing with others happily, and has been lucky enough to find a strong partner to help him live his dream. I love you, Cary and Erika. I'm one lucky mom. Wow! What great photos and what a good experience. Sounds as if he takes after his Mom! I can hardly wait for my husband to come home so I can show him those fish! Yep, they're big honkers! Of note: my son is 6'4"...so really are some big fish!